Deep Practice Encouragement – Part 2 | Mediterra - Swim & Run Better Than Ever! Now, a bit of practical advice on Deep/Deliberate Practice. 1. Make it a specific, clearly-defined, skill objective. “I am going to swim faster,” doesn’t work. Why? Because it does not indicate precisely what skill you must activate or develop in order to achieve that. What specifical skill (i.e. muscle commands) are you trying to do better? “I am going to hold SPL at 19, then increase Tempo by -0.02 seconds per 100 meters,” will work. Why? Because you specified exactly what commands you are going to give to your muscles in order to achieve a precise speed increase. “I am going to breathe every third stroke, and make changes on the left side (weak side) in order to make it feel as smooth and easy as the right side (strong side).” That’s a specific, clearly-defined, skill objective. 2. Maintain a direct, immediate feedback loop. If you are trying to test your neuro-muscular memory for a certain pace, you can set your Tempo Trainer to beep at the moment you are suppose to touch the wall (or look up at the clock to check). You’ll find out after you’ve performed one length – after the work is done. If you are trying to train your neuro-muscular memory for a certain pace then you need to set your Tempo Trainer to beep on every single stroke (or, on each second stroke, or each fourth stroke, if you are ready to wean yourself off of the TT), and count strokes, so that you have direct and immediate feedback in the middle of your swim telling you that you are holding the intended pace or not. Can you imagine learning to play the piano, but only by hearing the sound your fingers make 20 seconds later? Same idea. The more immediate, the more direct the feedback you can set up, the more powerful the training activity will be. Measuring speed by SPL x Tempo control is an example of objective (external, unbiased) feedback. Subjective (internal, possibly biased) feedback is just as important to use and to hone. How do you measure a better breath? You can see how objective measurements cannot give sufficient input about this. A good breath is one that feels really comfortable (no straining to get into position), allows a generous amount of intake, and fits smoothly into the stroke rhythm without disrupting body position at all. These are mostly subjective, internal measurements. But they are the ones that matter most to you. 3. Maintain highest quality attention. 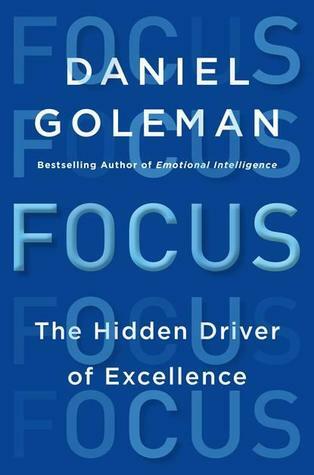 There is another good section on this topic in Chapter 15: The Myth Of 10,000 Hours, in the book Focus, by Daniel Goleman. Goleman also cites Ericsson’s work, and others. From every description we’ve heard of Michael Phelps racing experience (I shared a link to one of these in this previous post: Swim Prep Habit), or just about any other highest performing competitor we admire, we see that consistency and intensity of focus is a central trait. Our competitive coaching mantra is: We practice like we will race, and race like we practice. Practice full concentration on specific features you can control and you will be able to maintain control over those features under the stress of challenging conditions that you have trained it for. We can readily appreciate the importance that emergency medical, military and rescue personnel place on this kind of practice so that they can perform with calm precision under the most difficult circumstances. We take our cues from this high-stakes realm of training in order to make our recreational performance much better too. The well-designed objective you’ve set by Principle #1 shows you exactly what to keep your focus upon. 4. 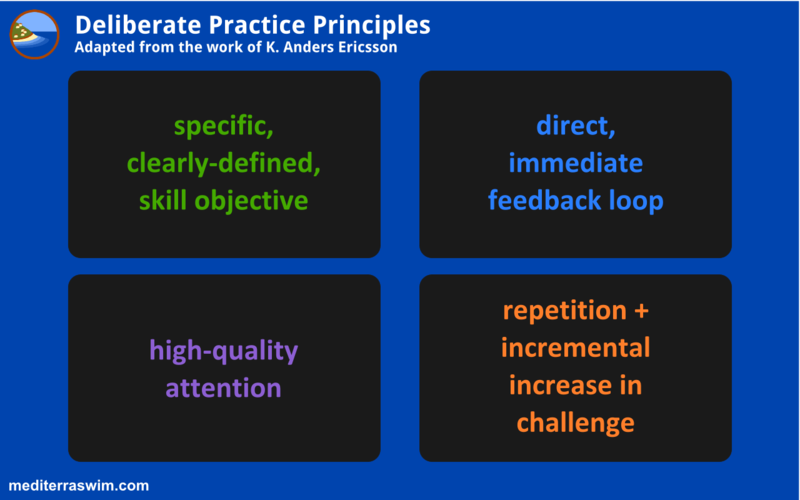 Provide repetition with incremental increases in challenge. This is repetition-with-focus, inseparable from Principle #3, and aimed at a specific objective noted in Principle #1. The incremental increase in challenge allows you to maintain then improve concentration as you make small, specific changes in stroke control (i.e. muscle commands). This way you can actually improve your ability to perform at higher levels of intensity, under higher levels of metabolic and environmental stress. The well-designed feedback loop allows you to see what you are doing in the middle of the act of swimming so you can compare that to what you intended to do, and make necessary corrections immediately. Try to jump ahead, adding too much increase in challenge/complexity, too soon, and the optimal improvement process breaks down right away. So, the basis of our training process in Total Immersion is hopefully making sense now. ‘Quit thinking and just swim’ is a way to rest the brain for a little while, yes, but you need to turn the concentration back on in order to get better at your swimming. Maintain and strengthen concentration as a habit to your performance advantage or turn off your conscious observation (lose discipline for it) your performance peril. This is not some TI coach’s opinion on the matter, but the overwhelming consensus of the latest neuro-science and neuro-psychology. This article clarified things for me well. Applying this in my own training and in helping others around me has worked well. However, I have seen something that prevents this process working – the swimmers beliefs about what they are trying to learn and how to learn it. For example, if a swimmer (consciously or sub-consciously) believes that training must leave you exhausted, then no amount of logic or practice will allow this deliberate practice to succeed. As open as they try to be to improving their technique, it never seems to be effective. On the other hand, when the swimmers believes that this is how learning & skill development works, then this deep practice surprises them with the results they achieve. Once again, thank you for these insightful articles. One of my best friends has this exact attitude (a life long runner) when he is in the pool. But the more I study how the body and how performance works the more I realize this is an attitude that is not based on science but on something else – pride or cultural programming perhaps. And I do understand how strong the appeal is because I feel the desire to be ‘wasted’ a bit too – that’s my traditional programming which I still have to resist (I am much better at it now). I have to train consciously with wisdom to avoid and rise above injury and vulnerable spots, or else I pay for it right away. And that was the key for me – injury caused me to wake up. I was seriously injured at 21 and prematurely retired from competition caused me to start maturing in my understanding of how I need to train this body – and I am still learning. Those who want to smoke themselves in every practice will keep going until the body quits and then they’ll find there is nothing left to salvage. Wasted tissues and adrenal glands will shut down eventually. A tragedy but these people have freedom of choice and freedom of access to the same information on how the body works and how real, mature performance training works. My approach now is to just be a silent example, be patient and kind and be available when their curiosity is piqued. I want to make it as easy to be approached as possible (by not preaching) when their pain and injury does start to appear and slow them down (for it will, for most) and then there might be some help still possible for them. Thanks for your prompt reply, Matt. One swimmer I was thinking of is a woman of 63 yrs who has been very successful with her swimming. Her success makes her unspoken beliefs about what to do to succeed very strong. After all, why change what has worked well for her? I can see that she can be more efficient, though. I resolved recently to do exactly as you suggested. Train with her while she does her 10 x 300 m at a fixed pace until number 6 or 7 gets hard, then gently suggest ways she may make it easier. Sometimes she gets it.